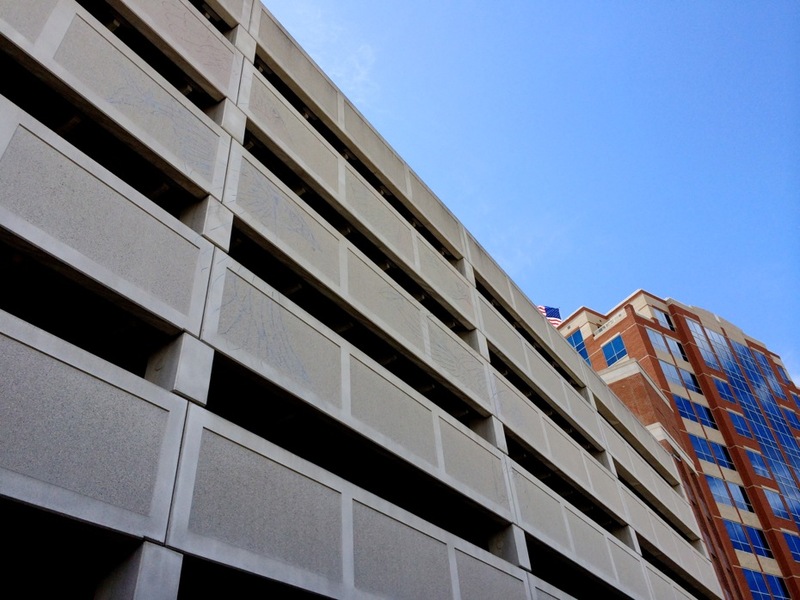 If you look closely, you can make out the mural pattern on the garage. 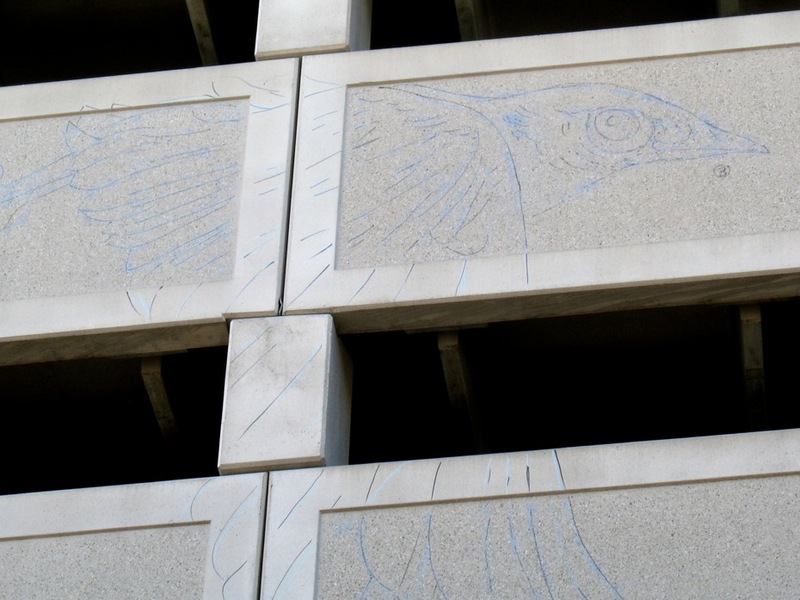 Over the next few weeks a flock of birds will emerge in downtown Albany. A flock of really big birds. The side of the Quackenbush Parking Garage that faces the Clinton Ave off ramp from I-787 will serve as the canvas for a new mural depicting Eastern Bluebirds flying into downtown. 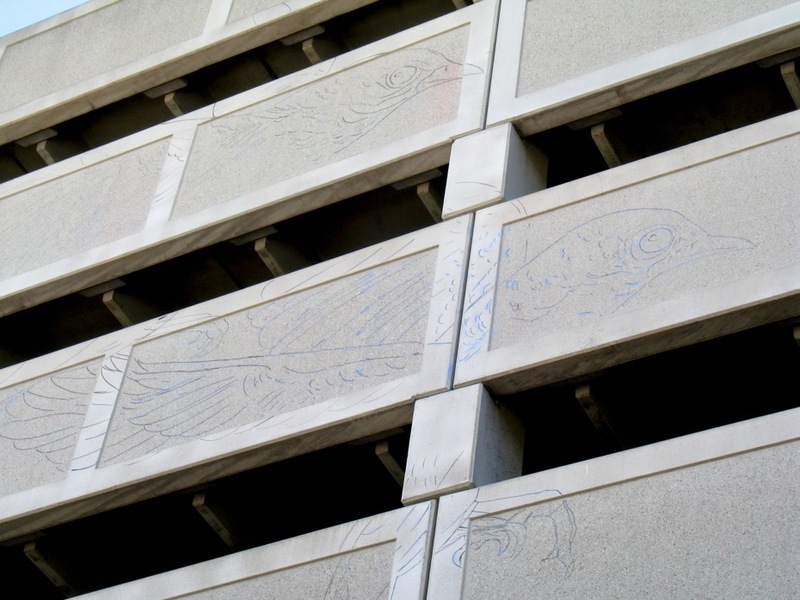 The Albany Parking Authority commissioned local artist Michael Conlin to create the work. "There's something great about seeing a fantastic piece of art, for free, on the side of a building as you're coming to a city," APA exec director Matthew Peter said Monday after the public announcement of the project. "It sort of feels like you're supposed to be here." Peter said the parking authority has been looking at ways of making its parking garages more welcoming. That includes lighting and signage -- but also art. This mural is a pilot and could be the first of a series. The authority has plenty of canvas space. 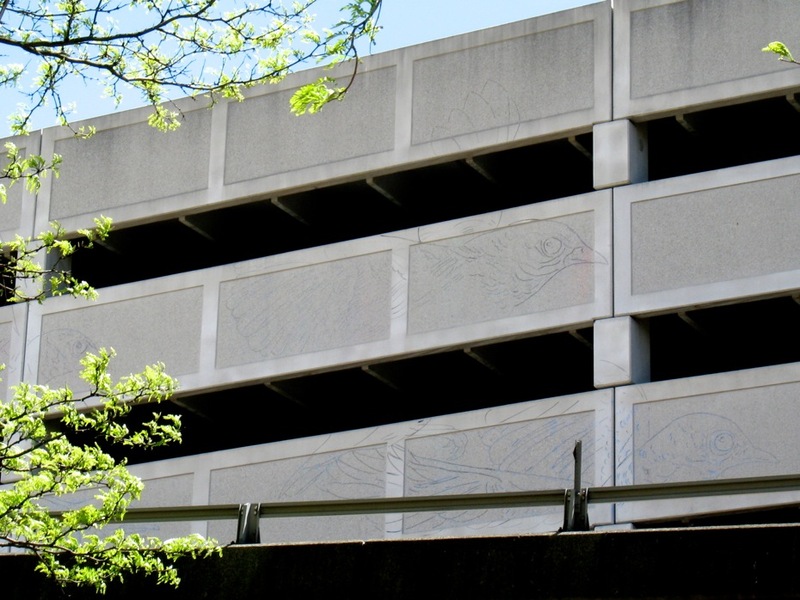 It has three garages around downtown Albany -- Quackenbush, Riverfront behind Kiernan Plaza, and Hudson-Green near the TU Center. The total cost of the mural -- from start to finish -- will be about $12,000, according to Peter. That money is coming out of a parking authority budget for garage upgrades. Mayor Kathy Sheehan said the Quackenbush garage's location also presents the opportunity to send a message to people entering the city. And right now the rather plain-looking wall is like a blank message. "It's not just a garage, it's an urban canvas," Sheehan said during a press conference. 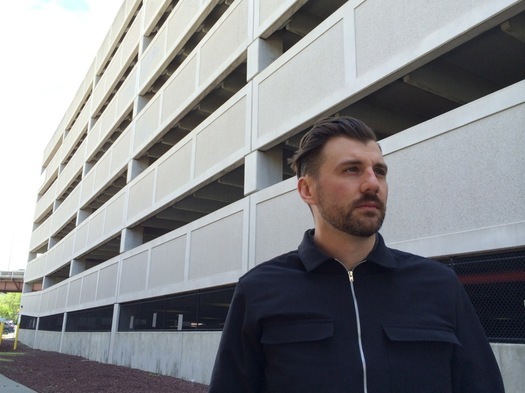 "And taking advantage of those urban canvases anywhere we can is really going to transform that entryway and, I hope, the way that people feel as they enter the city of Albany." You've already seen some of Conlin's work. His mural work includes the side of Wolff's Biergarten on Broadway in Albany. He also does custom sign painting for businesses -- a recent client was Hamlet and Ghost in Saratoga Springs. And (if you're viewing this during May 2016) look at the top of this page -- Conlin was the illustrator for the current AOA seasonal banner. "It's the biggest I've ever done," he said today of the garage mural (it's approximately 25 feet by 85 feet), "but it's moving right along, which is a nice surprise." Between the size of the mural and its location, the work has the potential to become an Albany landmark. During Monday's press conference, Conlin said he was humbled by the opportunity. "There are some beautiful landmark murals in Albany," he said to us afterward, "and if I become part of that alumni, it's an honor." There a few photos of the garage and Conlin's pattern for the mural above in large format -- click or scroll all the way up. Awesome! Why not try to make something ugly a little more beautiful?! I hope the city and/or parking authority maintains this mural over the years. Perhaps the "landmark" designation will help with that. Every time I head toward the entry ramp to the Dunn Memorial Bridge in Rennselaer (off of Broadway), the faded, peeling paintings on the columns -- you know, like the one that says, "Big things are happening in your city right now!" -- make me a little bit sad. Excellent. Now get cracking on that refrigerator building. @N -- The faded, peeling painting you referenced is actually only a few years old, but was damaged by the flooding from Hurricane Irene in 2011. So it didn't get to look nice for long. The others are more than 20 years old.